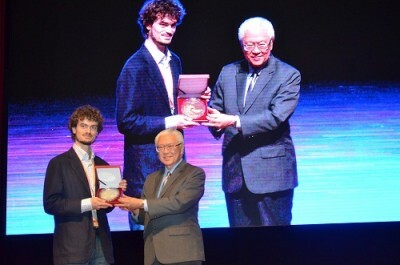 SINGAPORE — M+Visión Fellow Luca Giancardo won the $100,000 top prize and a gold medallion in the 2015 Singapore Challenge, a component of the Global Young Scientist Summit (GYSS@one-north) in Singapore, on January 23, 2015. 12 Nobel Laureates, 4 Turing Awardees, 2 Fields Medalists, 2 Millennium Technology Prize Winners and nearly 300 young scientists participated in the five-day event. As a participant in GYSS@one-north, Luca was invited to submit a whitepaper addressing the topic of “Ageing-in-place.” He proposed on behalf of an M+Visión project team, neuroQWERTY, and their whitepaper was one of 10 selected from 55 submissions to advance to the finals. Tony Tan Keng Yam, The President of the Republic of Singapore presented Luca with the first place medal. Parkinson’s disease (PD), the second most frequent neurodegenerative disorder in the world, is clinically diagnosed many years after disease onset, when almost 50 per cent of dopaminergic neurons die. But subtle motor signs of PD, such as tremor and rigidity, are known to happen up to a decade before clinical diagnosis. neuroQWERTY’s algorithm identifies the motor signature of at-risk individuals by studying their finger interactions with laptops, mobile phones and tablets. neuroQWERTY can be used at home, allowing for high compliance and monitoring of longitudinal change. In pilot studies, neuroQWERTY detected the motor signature of early PD patients by analyzing 15 minutes of non-privacy sensitive typing behavior. They propose to study individuals at high risk of PD to detect subtle motor decline correlated to disease. Eventually, the team hopes to conduct a mass screening of the general population. neuroQWERTY is an ongoing M+Visión Team Project in the Madrid–MIT M+Visión Consortium. The team comprises Senior Fellows Giancardo, Álvaro Sánchez Ferro, Carlos Sánchez Mendoza, and Ian Butterworth. They work closely with clinical collaborators at Hospital 12 de Octubre and Clinico San Carlos in Madrid, Spain, Massachusetts General Hospital in Boston, and Harvard Medical School. Giancardo is also in MIT’s Translational Fellows Program, which empowers postdocs to lead commercialization planning efforts, facilitating the launch of successful commercial ventures. The M+Visión Consortium is a partnership of Comunidad de Madrid and MIT, and this project has been financially supported by the Comunidad de Madrid. The Madrid-MIT M+Visión Consortium is a partnership of leaders in science, medicine, engineering, business, and the public sector dedicated to catalyzing change in Madrid’s healthcare innovation ecosystem. It was founded by Comunidad de Madrid, through Fundación para el Conocimiento madri+d, in 2010, in partnership with the Massachusetts Institute of Technology (MIT). La Fundación para el Conocimiento madri+d (or, Madri+d Knowledge Foundation, pronounced “Madri-mas-d”) is a network that connects public and private research and regional associations, integrating academia and industry to improve the competitiveness of the Madrid region. The Translational Fellows Program (TFP) is a competitive, nomination-based, year-long postdoc program that funds its fellows for a-day-a-week, providing them the opportunity to pursue commercialization of a technology that originated in MIT research. The program provides mentoring resources, integrated conflict-of-interest (COI) management and other support to help contain risk and maximize the opportunity to create a new venture. The TFP empowers postdocs to lead commercialization planning efforts, facilitating the launch of a successful commercial venture. The TFP aligns resources available through MIT’s rich entrepreneurial ecosystem to bridge the gap in the chain of research-based innovation and accelerate the pace of technology translation, thus increasing the impact of MIT’s research-derived innovations.